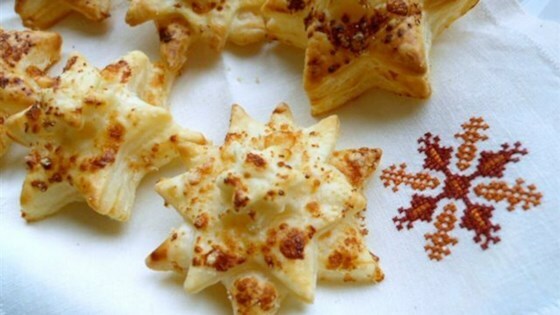 "Parmesan and puff pastry are all you need to create these yummy party nibbles. During the year you can cut out hearts for Valentine's Day or you can eat them like an open-faced sandwich with salmon, cheese, or prosciutto. Be creative and enjoy!" Dust a flat work surface lightly with flour. Unroll both puff pastry sheets and roll each one out to a rectangle of the same size. Brush one puff pastry sheet with a little water and sprinkle with 1/2 of the Parmesan cheese. Lay the second puff pastry sheet on top, brush with water, and sprinkle with remaining Parmesan cheese. Using a large star cutter cut out about twelve 2 1/2 to 3 1/2-inch stars. Place stars on prepared baking sheet and chill in the fridge for 15 minutes (or 5 minutes in the freezer). Bake in the preheated oven until puffed up and golden brown, 15 to 20 minutes.